Apparently October 15th is "Bridge Day", however upon inspection this isn't actually a day to celebrate bridges, but a day to celebrate BASE Jumping. BASE Jumping, the hobby where you hurl yourself off a building, cliff, or some other structure, and parachute/wingsuit fly down, it not something that I have any experience of - neither do I wish to! - so I'm going to defy the details of the day and cover bridges, and in particular, the Humber Bridge. 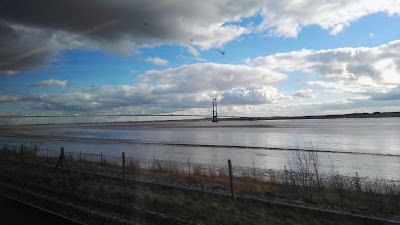 I typed "bridge" into my Google Photos and this is the only photo of the Humber Bridge that came up. I could go and take a photo but I'm in my pyjamas and that just seems like too much effort. The Humber Bridge, linking the north and south banks of the River Humber, opened in 1981 after the best part of a year of engineering and construction work, is one of the longest (and was the longest) single-span suspension bridges in the world. The bridge connects the East Riding of Yorkshire to North Lincolnshire, allowing travel between. Also, I love the road on the south bank leading to and from the bridge - a nice big dual carriageway, generally low on traffic, which is easy to drive. The Humber Bridge even has its own Country Park, which is really nice to walk round. But I think what I like about it is how I can get to a whole different county over the bridge. Lincolnshire is different to Yorkshire, in a way that I venture the ridings of Yorkshire (East, West, and North) aren't. Whilst the accents in Yorkshire gradually change and evolve as you travel from village to village, going over the bridge exposes you to a significantly dialect, where the phrase "Now then" can be a greeting, a comfort, or a warning, depending on the tone, and "Guide Thysen" is definitely a warning! The bridge over the Ohio river in Cincinnati, from Ohio to Kentucky and the whole world changes. Hi Mike! The caption under the photo is hilarious. Thank you for making me smile/laugh. Great read.